This entry was posted on Tuesday, November 6th, 2018 at 10:46 am. With the centenary of the armistice approaching, artist Helen Chester will be unveiling new works that delve into the psyche and experiences of veterans and soldiers, in an exciting series of portraits. On Tuesday 6th November the Westbury artist will showcase her latest series of dramatic portraits in the prestigious surroundings of The Royal Hospital Chelsea, home of the Chelsea Pensioners, at an event celebrating the literally ‘ground-breaking’ work of the charity Waterloo Uncovered. For the last 18 months, Helen has been working with veterans, and those still serving in the armed forces, who have taken part in the archaeological excavations at sites of the Battle of Waterloo with the charity Waterloo Uncovered. Through the use of portraiture Helen tells the subject’s story, illustrating their personal histories while juxtaposing elements of the Battle of Waterloo in order to create a series of unique, moving and sometimes unsettling honest portraits, shown for the first time on Tuesday 6th November at the Royal Hospital Chelsea. Waterloo Uncovered is a registered UK charity that combines a world‐class archaeology project on the battlefield of Waterloo, with a support programme for veterans and the military community. Working in partnership with some of Europe’s top universities, and through the unique perspective of a team comprised of archaeologists, veterans, and serving soldiers, Waterloo Uncovered aims to understand war and its impact on people — and to educate the public. “Each portrait been joint effort,” explained Helen. “At the start of the project, Waterloo Uncovered sent out a questionnaire to those interested in having their portrait painted. This asked about military service, experiences while serving, life-changing events, diagnosis and their experience and thoughts about their time at Hougoumont, Belgium with Waterloo Uncovered. Each person shared as little or as much as they felt comfortable with and when it came to painting, they were able to veto any of the images I included. If it was too disturbing, incorrect or they just didn’t think it helped their story, it was changed or painted over. On the other hand, if they wanted a subject included, that was added in too. 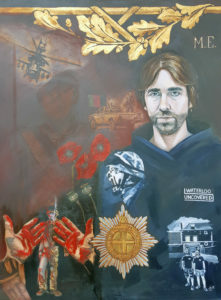 From her moving portraits of men and women of the First World War to her emotive depiction of UK veterans with Post Traumatic Stress Disorder, Helen has gained recognition for her striking artworks that not only capture the likeness of an individual but also, through the use of vignettes, tells the subjects’ story. Gaining commissions from the Aldershot Garrison, the families of Victoria Cross recipients and those in the military, her work with Waterloo Uncovered is a natural progression.